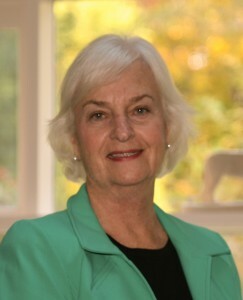 Carol Collier Kuhlthau is Professor Emerita of Library and Information Science at Rutgers University where she directed the graduate program in school librarianship that has been rated number one in the country by U.S. News. She achieved the rank of Distinguished Professor, a special rank at Rutgers requiring additional review beyond that for full professor. She also chaired the Department of Library and Information Science and was the founding director of the Center for International Scholarship in School Libraries (CISSL). She is internationally known for her groundbreaking research on the Information Search Process and for the ISP model of affective, cognitive and physical aspects in six stages of information seeking and use. She has authored Seeking Meaning: A Process Approach to Library and Information Services and Teaching the Library Research Process and published widely in referred journals and edited volumes. 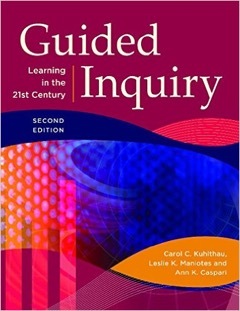 Two new books, Guided Inquiry: Learning in the 21st Century and Guided Inquiry Design: A Framework for Inquiry in your School, authored with her daughters Leslie K. Maniotes and Ann K. Caspari are now available through Libraries Unlimited. She has received numerous awards including: American Society of Information Science and Technology (ASIST) Research in Information Science Award; Association of Library and Information Science Education (ALISE) Award for Outstanding Contributions in the Field of Information Science and Library Education; Library and Information Technology Association (LITA) Kilgour Research Award; American Library Association (ALA) Shera Award for the Outstanding Research; Association of College and Research Libraries (ACRL) Dudley Award; American Association of School Librarians’ (AASL) Distinguished Service Award; Association for Educational Communications and Technology (AECT) Award for Outstanding Contributions to the School Library Media Field through Publishing, and Teaching; Association for Information Science and Technology (ASIS&T) Award of Merit, 2013. Kuhlthau has held visiting appointments at the University of Tampere, Finland; University College of Boras, Sweden; University of Gothenburg, Sweden; The Royal School of Librarianship, Copenhagen, Denmark; Federal University of Minas Gerais, Brazil; National Taiwan University, Taipei, Taiwan; Taiwan Normal University, Taipei, Taiwan; Keio University, Tokyo, Japan; Doshisha University Kyoto, Japan; University of Leiden, The Haag Campus, The Netherlands; Aalborg University, Denmark; University of Technology, Sydney, Australia; Queensland University of Technology, Brisbane, Australia; School of Information Management and Systems at Monash University, Melbourne, Australia; University of Hong Kong, Hong Kong; Department of Information Management, Robert Gordon University, Aberdeen, Scotland; Fulbright Senior Specialist, University of Zadar, Croatia; University of Parma, Italy and University of Tallinn, Estonia. “Reflections on the development of a theoretical perspective” In Theory Development in the Information Sciences. edited by Diane H. Sonnenwald, chapter 4, pp.68-86 University of Texas Press, 2016. Kuhlthau gave the Keynote at the European Conference on Information Literacy (ECIL) in Tallinn, Estonia, October 19 – 22, 2015. Title: “Rethinking Information Literacy in the 21st Century” Abstract: There have been extraordinary advances in information technology since information literacy emerged in the last quarter of the 20th century. These advances have brought rapid change in all aspects of our lives. The workplace has changed. The way we communicate has changed. Our communities are changing. Are our notions of information literacy outdated? It is time to rethink information literacy for the shifting demands of the global information society in the 21st century. Brazilian School Librarians Award in honor of Carol Kuhlthau will be awarded again in 2015. The Carol Kuhlthau Award is a tribute to the North American LIS researcher professor Carol Collier Kuhlthau, which plays a distinguished role in the area of school library and has been collaborating since 1998 with the Study Group on School Library, based in the School of Information Science at the Federal University of Minas Gerais, Brazil (http://gebe.eci.ufmg.br/). It aims to stimulate initiatives undertaken by Brazilian librarians or library students, which stress the educational function of the school library, involving students in their activities. Four editions of the Award have occurred, in 2004, 2006, 2007 and 2013. So far nineteen librarians, library science students and other professionals working in schools libraries have received the Award. In 2015 the Award will be given to two library students, enabling them to participate of the 2nd Brazilian School Library Forum that will be held in July 2015 in São Paulo. The highly regarded educators’ newsletter, Marshall’s Memo highlighted a synopsis of “Making the Shift” From Traditional Research Assignments to Guiding Inquiry Learning.” by Leslie Maniotes and Carol Kuhlthau published in Knowledge Quest November/December 2014. 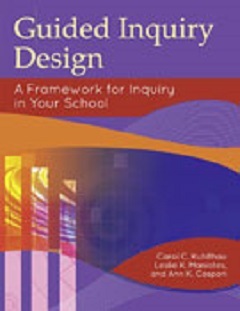 Guided Inquiry Design: A Framework for Inquiry in Your School Written by: Carol C. Kuhlthau, Leslie K. Maniotes, and Ann K. Caspari Click here to read description of Guided Inquiry Design: A Framework for Inquiry in Your School. Available on Amazon and ABC-CLIO. Click here to read the Preface of Guided Inquiry: Learning in the 21st Century. 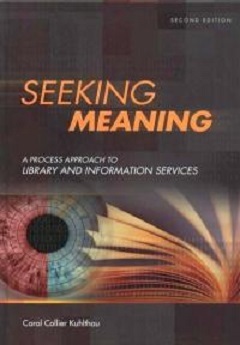 A 2nd edition of Seeking Meaning: A Process Approach to Library and Information Services is available through Libraries Unlimited. Available on Amazon and ABC-CLIO. Guided Inquiry: School Libraries in the 21st Century. University of Zadar, Croatia, Summer School in User Studies in the PhD Program in Knowledge Society and Information Transfer, April 11-14. Keynote – “Building on the Classics: Current Trends in User Studies.” Lecture – “Building a Research Agenda: Problems, Models, Theories.” Workshop – “Operationalizing Research Results for Application in Services and Systems.” 2012. University Tallinn, Estonia, Visiting Professor, Digital Library Learning International (DILLI) joint MA program, May 2011. University Parma, Italy, Visiting Professor, Digital Library Learning International (DILLI) joint MA program, October 2010. IASL 2009 in Padua, Italy. Preconference Workshop on August 31”Guided Inquiry: Strategies for Teaching the 21st Century Learner.” Plenary Address on September 2 “Guided Inquiry: Learning in the 21st Century.”, August 31-September 4, 2009. Opening keynote address at the International Association of School Librarians conference in Padua, Italy on September 2, 2009. AASL National Conference in Charlotte NC, Preconference Workshop “Using Guided Inquiry to Accomplish 21st Century Learner Standards” with Leslie Maniotes and Ann Caspari. Concurrent Session with Maniotes and Caspari “Guided Inquiry and AASL Standards = 21st Century Learning”, November 5-7, 2009. University of Zadar, Croatia, Fulbright Senior Specialist, May 2009. New Jersey Association for School Librarians (NJASL) Annual Fall Conference, November 14 and 15, 2008, “Guided Inquiry +AASL Standards = 21st Century Learning” with Leslie Maniotes and Ann Caspari. Keynote at the Symposium on Social Aspects of Digital Libraries and Information Seeking at the National Taiwan University, December 11-12, 2008, “Individual in Community: Social Aspects of the ISP”. “Considerations for learning in the 21st century.” Public lecture at the University of Gothenburg, Linnaeus Centre for Research on Learning, Interaction and Mediated Communication in Contemporary Society (LinCs), April 3, 2008. “Guided Inquiry: Learning in the 21st century.” Keynote at Learning, Innovation and the use of Information conference, Aalborg University Library, Aalborg, Denmark, April 1-2, 2008. “ISP Revisited: Is the ISP model still useful?” With Jannica Heinstrom and Ross Todd. Paper accepted for presentation at the Information Seeking in Context conference, Vilnius Lithuania, September 17, 2008. “Information Search Process” an entry in the 3rd edition of the Encyclopedia of Library and Information Sciences, edited by Marcia Bates and Mary Niles Maack. 2007. Visiting Professor at the Department of Information Management, Robert Gordon University, Aberdeen, Scotland, June 2007. Keynote Address at the i3 conference, “Building on Success” Robert Gordon University, Aberdeen, Scotland, June 25, 2007. “From Information to Meaning: Confronting Challenges of the Twenty-first Century Libri, 8:2, 66-73, 2008. The Lazerow Lecture at the University of Kentucky, School of Library and Information Science on April 2, 2007. Professor Kuhlthau was awarded the American Society of Information Science and Technology, SIG USE Award for Outstanding Contribution to Information Behavior Research, 2006. NJASL has honored Professor Kuhlthau for her contribution to school librarianship in NJ with lifetime membership. “Longitudinal Evidence of the Influence of the ISP on Information Workers.”, 2018. Carol Kuhlthau selected for 2016 SC&I Distinguished Alumni Award. Carol Kuhlthau selected for Association for Information Science and Technology (ASIS&T) Award of Merit, 2013. NEW EDITION AVAILABLE! : The new edition of Guided Inquiry: Learning in the 21st Century that includes a comprehensive, concepts-based Information Literacy curriculum is now available.